2014 has just begun, which means it’s time to work towards those New Year resolutions. It might seem difficult to lose weight or stay in shape during a vacation… but not at Hacienda Tres Rios! Here are 4 ways to counteract all those long, leisurely dinners and visits to the Patisserie Café de Paris. With the exception of the Segway tour, all of our Nature Park tours require physical activity, take a kayak, snorkel or bike tour, or simply take a long walk through park. 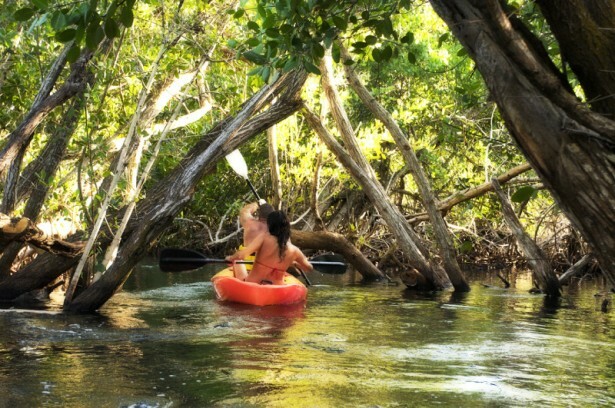 Tres Rios Nature Park is 326 acres of unspoiled Mayan jungle. You can’t go north (unless you want to run in the jungle) but if you walk down the beach and turn right (south) you can run for miles. Running in on the beach is an excellente workout due to the resistance the sand provides. Our activities team, the Creation of Moments Team, teaches classes each day, including yoga, water aerobics, pilates and stretching. These classes are not only fun, but are a great way to meet other guests. If you don’t care much for exercising in outdoors, Hacienda Tres Rios offers an air-conditioned gym that includes treadmills, elliptical machines and weights. Bring along your iPod or watch news from back home on the flat screen television. See Hacienda Tres Rios’ Specials and Packages here.